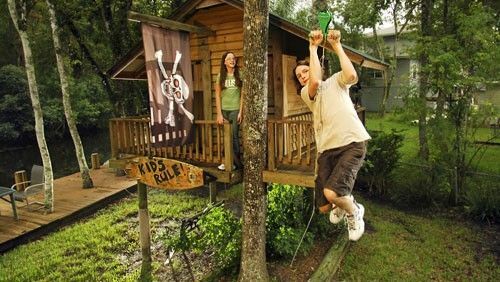 We have decided to run a new promotion with our website (www.ziplinestop.com) to encourage people to ask questions and leave comments for others about their backyard zip line kits. July's topic will be about Zip Line Kits. Once you have determined what you will anchor to, you then want to make sure you will have a completely clear path! You don't want to be smacked by branches and leaves as you zip down your line. You also want to make sure that the anchors will be suitable enough to support about a 6% drop in the cable line. Any successful zip line will of course, require a little bit of planning and you're off to the right start. You will also want to take into consideration that you must account for about a 2% drop that will occur in the center of the cable due to sagging. Once you realize this you can adjust the cable to give you the correct speed. Alright, once your path is clear, it is time to set up your cable line. I used a chain wrapped around a oak tree with a turnbuckle for my first zip line, and for the other anchor I used the slack from the cable wrapped around the second tree. It is a good idea to use some type of rubber tubing on the cable line if you are wrapping it around a tree. It prevents slip and helps prevent the tree from damage, they also sell wooden tree protectors that keep the cable from moving. The idea is to pull the zip line cable as tight as you can with your turnbuckle full extended. By doing this, you will get the most amount of adjustment available to pull the cable tight enough. Once your cable is anchored on both ends, it is time to install your zip line braking system. See my blog post here about what type of braking system is right for you. Now that you've got your braking system set up it is time for a test run! This is the fun part! Ride your cable and see if there is excessive sagging, also pay attention to your speed. Are you moving to fast? Too Slow? *If there is too much sagging in your zip line you will need to tighten your cable more. If you are moving to slowly you will need to increase your zip line elevation. If you are moving to quickly you will need to lower your zip line elevation. After your test ride you will also need to make sure your cable is still tightly attached to both anchors, you will also need to re-tighten your turnbuckle and clamps. This will need to be checked regularly as part of maintaining the functionality of your zip line. A tow rope is commonly added to the trolley to assist in walking it back to the starting point of your zip line. I would also highly recommend using a harness if your zip line is fairly high off the ground, and if your zip line is more than 100 feet it is a good idea to buy a seat as your hands and arms will become tired. To purchase various quality parts and accessories for your backyard zip line kit please shop Zip Line Stop! Please remember that installing and operating your zip line safely is your responsibility! You must establish a safe and secure operating procedure to ensure the success of your zip line. 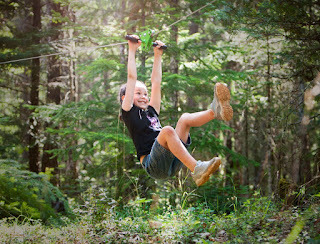 Children must always be supervised and taught how to properly operate your zip line safely! Zip Line Safety Tips Click Here. Which cable is better for my zip line? Stainless steel or galvanized? Galvanized is stronger than similar diameter stainless. Galvanized is 2-3 times less expensive than stainless (think of it this way, you could purchase 2-3 zip line cables using galvanized cable for the same cost it would take for one zip line using stainless steel). Galvanized is very weather resistant. Unless your location is next to the ocean (salt spray in the air causes corrosion) then the galvanized will last many years. Depending on use, expect 5-10 years.